Thanks to smartphones and several apps, Emojis have become a huge part of the Nigerian culture over the last few years. They have become one of the most popular forms of self-expression and there is something thrilling about communicating without them. Truth be told, they are not only cute, funny and are better for conveying feelings than a text does. Emojis are changing Nigeria’s social media landscape in a big way. From those with ‘heart-shaped eyes’ or ‘thumbs up’, there is basically an icon for every occasion. Nigerians are naturally happy people who can be light-hearted about any situation and so for those who are still green as regards using these trends Jovago.com, Africa’s No.1 online hotel booking site has compiled a list of the top 4 Emojis that will appeal to anyone wishing to express feelings of happiness. 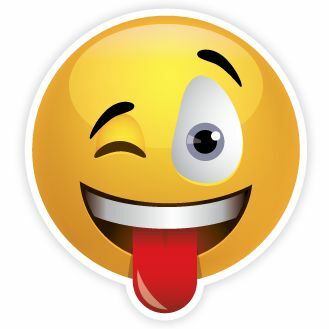 This is possibly the very first emoji introduced to Nigerians. Easily achieved by typing a combination of ‘:” and “)”, the emoji is the universal ambassador of good will. It is used to not only soften certain comments and instructions that otherwise would seem dry or sarcastic, to show that it a message sent from a good place or just used to show that happy agreement. Basically, this is an icon no one can go wrong with. Happy people are always sharing love and affection and the heart Emoji is a good way to express those feelings. Love makes the world go round and so, this Emojis has been known to solve a lot of quarrels and has saved a lot of relationships romantic or otherwise. There really is no real happiness without a bit of kidding and fun. While this Emoji cannot be used in serious situations at all, it is useful for silly moments of glee where you want to share good feelings with a bit of mischief. This icon can be used to enhance or add extra meanings to other icons. This icon is perfect for showing that you find a comment extra funny or hilarious. Most people like to think that they are funny and it gives them a measure of happiness when they feel that they have put a smile on another person’s face or made them laugh. This icon is also used to draw attention to a post that could give a few laughs and brighten someone else’s day.